Spectacular views are the highlight of this 1-1/2 story design. 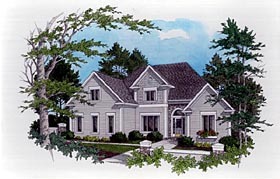 This variation on the classic "Cape Cod" style is designed for a lakefront or golf course lot. The handsome exterior is accented with stonework and cedar shakes. This 3012 square foot home, while spacious and luxurious, was designed to be affordable. Just beyond the two-story entry is this home's focal point, it's family room. From the coffered ceiling to the sunken floor, the fireplace/entertainment center to the dramatic 8' french doors, this room has to be experienced! To the front, is an elegant dining room with a tray ceiling\; To the rear, a full-featured open kitchen featuring a 6'x3' island with breakfast bar. The stairs are conveniently located between the breakfast area and family room. The master suite features a double-step tray ceiling, a luxurious bath and a 15'x7' walk-in closet. Other than trays and vaults, ceiling heights on this level are 9'. Upstairs are three secondary bedrooms. Bedroom #2 could serve as a second master suite with it's private bath and tray ceiling. Bedrooms #3 & #4 share a "Jack & Jill" bath. There is direct access to two large storage areas. Other than vaults, upstairs rooms have 8' ceilings. Question: How long does it take to update this plan to 2x6 for exterior walls 2018 IRC, does this plan include framing and foundation plans and what is the roof load design? I live in MA and the requirement is 40 psi. Question: What year were these plans drawn or updated to current national codes?